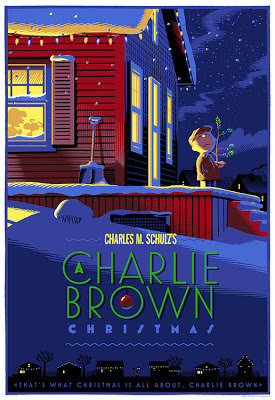 If you want to see A Charlie Brown Christmas sometime before it airs again on ABC on December 18, 2012, you can watch it online for free at hulu.com or ABC.com . 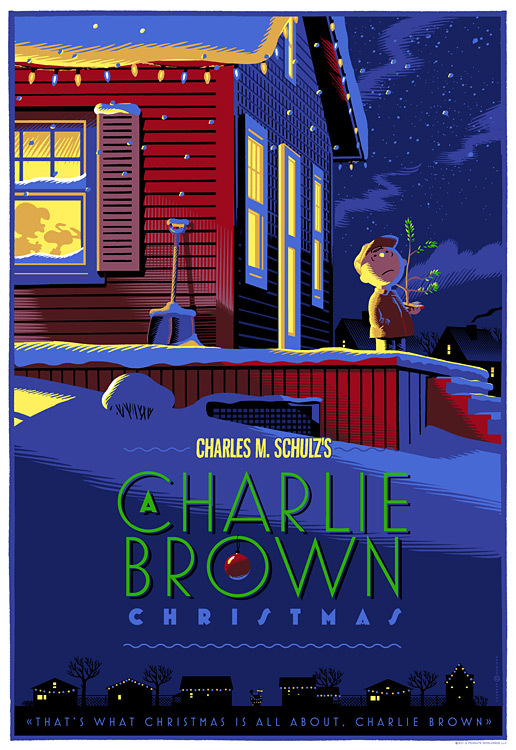 As on TV, the classic special is accompanied online by Charlie Brown's Christmas Tales. Update: as of January 2013, the show is no longer available online for now - but will probably be back in December 2013. It's time to join the Peanuts gang in counting down the days until Christmas, starting Friday, November 23, on the FiveCentsPlease.org home page. 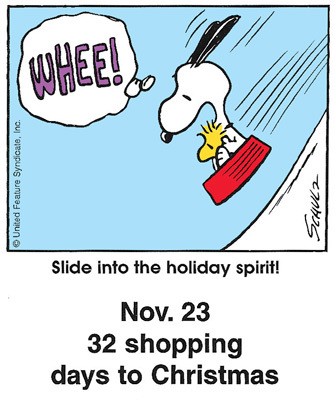 A different single-panel comic with a holiday theme will appear each day through Christmas. We've therefore reached back into the archives to bring you the countdown panels from 2001 instead (a year when Thanksgiving also fell on November 22). We hope you'll visit our home page each day and enjoy revisiting these panels with us, as the holiday approaches! The Peanuts gang is going to be showing up on television quite a few times this week and next; here's a complete list. All times below are for the Eastern and Pacific time zones. A Charlie Brown Thanksgiving will be broadcast both Wednesday, November 21 (the day before Thanksgiving) and Thursday, November 22 (Thanksgiving day itself). The special will air from 8 - 9 PM on ABC both evenings. A Charlie Brown Thanksgiving will be shown uncut, together with an abbreviated version of "This is America, Charlie Brown: The Mayflower Voyagers." On Friday, November 23 (the day after Thanksgiving), FOX will broadcast Happiness is a Warm Blanket, Charlie Brown, the most recent Peanuts animated special, from 8 - 9 PM . Then the cable channel ABC Family will be showing A Boy Named Charlie Brown and Snoopy Come Home, the first two Peanuts theatrical movies, on Monday, November 26. Snoopy Come Home airs from 5 - 7 PM, and A Boy Named Charlie Brown airs from 7 - 9 PM (all times Eastern/Pacific). 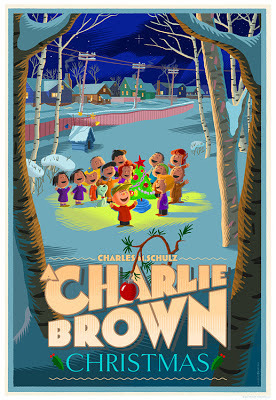 Finally, A Charlie Brown Christmas will receive its first broadcast of the year on Wednesday, November 28. It will air from 8 - 9 PM on ABC. The special will be unedited, and accompanied by a shortened version of Charlie Brown's Christmas Tales and the non-Peanuts short Prep & Landing: Operation Secret Santa. The cable channel ABC Family will be showing A Boy Named Charlie Brown and Snoopy Come Home, the first two Peanuts theatrical movies, on Monday, November 26. Snoopy Come Home airs from 5 - 7 PM, and A Boy Named Charlie Brown airs from 7 - 9 PM (all times Eastern/Pacific). This is slight change of schedule from the past few years, when ABC Family has broadcast the two movies on the weekend following Thanksgiving. A Charlie Brown Christmas will air twice on ABC this year. The first broadcast will be on Wednesday, November 28, 2012 from 8 - 9 PM (Eastern/Pacific time); the second broadcast will be Tuesday, December 18, 2012, also from 8 - 9 PM. The classic Christmas special will air unedited both times. The hour-long time slot will be filled out with a shortened version of Charlie Brown's Christmas Tales and the non-Peanuts short Prep & Landing: Operation Secret Santa. ABC will also be showing I Want a Dog for Christmas, Charlie Brown on Thursday, December 20, 2012 from 8 - 9 PM (Eastern/Pacific); and finally Happy New Year, Charlie Brown on Thursday, December 27, 2012 from 8 - 9 PM (Eastern/Pacific). Happy New Year, Charlie Brown will air unedited together with a shorted version of She's a Good Skate, Charlie Brown. 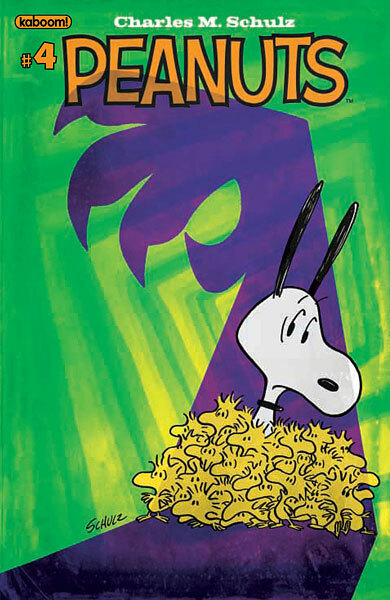 The FOX television network has announced that they will broadcast Happiness is a Warm Blanket, Charlie Brown, the most recent Peanuts animated special, on Friday, November 23 from 8 - 9 PM (Eastern/Pacific time). Happiness is a Warm Blanket first aired on television in November 2011, after being released on DVD earlier in the year. 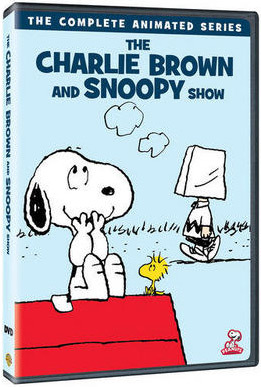 Last year it was broadcast at the same time as the classic special A Charlie Brown Thanksgiving; thankfully, that won't be the case this year - A Charlie Brown Thanksgiving will be shown the day before Thanksgiving (November 21) and Thanksgiving Day (November 22), but Happiness is a Warm Blanket will be shown the day after Thanksgiving (November 23). FOX will also air Happiness is a Warm Blanket, Charlie Brown on Monday, December 17, 2012, from 9 - 10 PM (Eastern/Pacific time).